Tor.com’s series of novellas is a breath of fresh air. These slender volumes are quickly becoming favorites of mine—the novella is an under-published form that for me perfectly hits the sweet spot between the satisfaction of finishing a book fairly quickly and feeling that I got my time and money’s worth. Here I review three of my favorites. I look forward to seeing more of these in the future. Eleanor West’s Home for Wayward Children is part boarding school, part safe-house, and part half-way house for those unfortunate children who at some point found their looking glass or wardrobe door—and the life they were meant to live behind it—and have now been pulled back into the mundane world, to wait for the moment when their doorway returns again, or until they lose hope and decide to build whatever lives they can for themselves here. For a reader like myself whose most desperate pre-teen wish was to live in Narnia (preferably while wielding a purple light-saber, an idea I didn’t find incongruent at the time), this premise is everything I could want or hope for. Our protagonist, Cora, is still readjusting to the mundane world and having a difficult time of it. In the watery world where she belongs, her physique makes her a formidable hero, a swimmer inured to the cold waters, sleek and strong, a destiny that her previous life on Earth hinted at as she excelled in endurance swimming while enduring the pressures and ridicule of a world that demanded that she take up less space. When the girl who drops from the sky into the pond behind the Home turns out to the be the daughter of Sumi, a deceased former resident of the Home, Cora finds herself a member of an inter-world search party and forced to forge a reluctant trust with her new schoolmates. The search ultimately takes them to the world of Confection—a Candyland-esque place that falls on the Nonsense axis of the rabbit-hole spectrum—where they must defeat the Queen of Cakes, find the final missing essence of Sumi, and return her to life so that her daughter can be born. Which is all exactly as delightful as it sounds. Apparently I’ve been living under a rock, because I actually didn’t realize this was part of a series until I was nearly done with it. 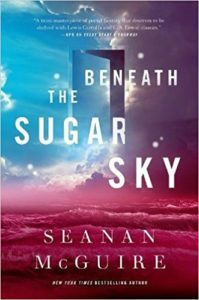 McGuire merges her characters’ backstory so seamlessly into the immediate tale that it stood perfectly well on its own, which is good news for anyone else who might want to jump in with Beneath the Sugar Sky, and great news for me, because now I know there’s more! The puzzles presented therein—Cantor dust, the Koch snowflake, the Sierpinski triangle—are finally enough to challenge him, and he devotes himself to understanding their mysteries. 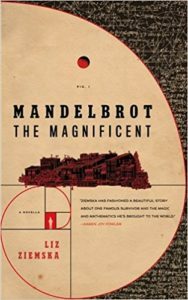 As the Gestapo’s net draws tighter around his neighborhood and his school rival grows bolder in his cruelty, Mandelbrot is introduced to another mystery that reaches the very heart of his heritage as a Jew and as a natural pursuer of underlying truths: the serifot. His rabbi explains: “Serifot is Hebrew for ‘emanations.’ According to the Kabbalah, it is the filter through which the Ein Sof, the Infinite, reveals Himself into the physical and metaphysical realm.” Between The Book of Monsters and the serifot, Mandelbrot’s view of the world is fundamentally changed. As he begins to penetrate the truth of the endlessly repeating patterns that we have come to know as fractals, he finds himself able to influence the world around him in surprising ways—and hopes that he can use this new power to protect his family. 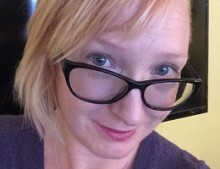 Ziemska, born in Poland herself, brings a literary and scholarly quality to what is inarguably a fantasy tale—or maybe it’s a fantastical quality to a scholarly tale. For all of my Googling, I couldn’t find a reference to a real mathematical collection called The Book of Monsters, but I was completely convinced of its existence during my reading of Mandelbrot the Magnificent. A grounding in the hard science of numbers, the immersion into a tragic history from the point of view of the young man living it, and a twist into fantasy makes this an excellent read for both genre and literary readers alike. 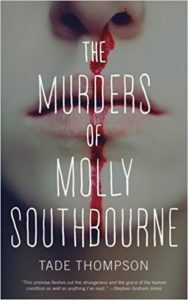 Tade Thompson’s The Murders of Molly Southbourne is grim, ghoulish, and utterly gripping. Molly’s Southbourne’s parents have made her memorize the rules. Some are easy to follow; some are not. A skinned knee, a paper cut, her first period—bad things happen when Molly Southbourne bleeds, things her parents are desperate to protect her from. Things that emerge from holes in the ground; things that look just like her. The mollys are drawn to her, no matter where she is, and are always her own age at the time they appear, whether she’s five or twenty-five. Some try to kill her right away, while others start out friendly, even needy—but eventually, they all go bad. If she’s particularly careless after some accident, there will be more than one. And as Molly grows up and craves independence, it will be up to her to eliminate the mollys that will inevitably follow. Her parents prepare her well, teaching her a hundred ways to kill them and dispose of them. Only the real Molly may live. This reader’s curiosity followed Molly’s own—what happens if she doesn’t kill them? Or if she makes one on purpose? What if she tells someone about them? Her questions and experimentation change as she matures and tries to separate herself from the sheltered life that her parents thought best and forge new relationships. Her evolving relationship with the mollys carries her from merely preventing and coping with them to trying to understand them. Are they separate from her, or part of her? Should she treat them with compassion? Would it matter if she didn’t? If there is a weakness in the story, it’s around the why of Molly’s condition—not a lack of explanation, but rather the opposite: We get one, but I never really felt I needed to know. I enjoyed the hints at her mother’s past, and her parents’ talents for everything from butchery to forgery, and felt that the hints were enough for me to build my own hypothesis. A science-y reason for someone like Molly’s existence gave it a Firestarter/Stranger Things feel and gave us a peek at the larger world beyond, but it came late in the story and had the effect of also piercing the hypnotic veil that Thompson had drawn around Molly and her predicament. That aside, I thoroughly enjoyed Molly and her many murders, and look forward to more skin-crawling stories from Thompson in the future.